To say they are “Wet Boys” like the corpse of my high school friend Tony Skifton, seems apt. Wet in the sense that the visceral cocoons; the plasma that surrounds their image through process of deterioration is complimentary to that of the tornado or cyclone found on opposing pages. I grew up on the Mississippi river in a small town not too distinct from other small towns, but with a yawning laziness that carried the town from its enclave of mid-western commercial hub between the west in former pasts to that of college town with zero bravado. Its geography; a confluence of where not only the Mississippi river, but three combined rivers meet. One of these rivers which, called black, meets the other two in a triumvirate of folkloric significance. It was said that in this town…a fierce wind in the manner of a funnel would never touch its shores due to the meeting of these three rivers. It was something the white man had appropriated from the legions of natives that used to live here before we gave them blankets infected with European disease. These blankets were stitched to their skin, trade for their knowledge of raising corn, a knowledge from which we would plant seed and effigy under the guidance of. This knowledge carried away countless crows from eating what was ours on the land. Our forefather’s had given this same educator, who taught us sustenance; the blankets inculcated with small pox. These were same blankets that they would wrap around their wives and children. This same Mississippi river, its ebb and flow and undercurrents licking at the ankles of our own youth on radiant summer days would later become the same currents that carried away young men to its own bosom, with a sinking dance only to regurgitate them on their shores in the dead of winter, half-eaten by fish, turtle, and crab. It went unnoticed for ages; the young men pulled into the grinning and running maw of the Mississippi. I knew Anthony Skifton, I went to school with him, smoked weed with him, and teased him about his infatuation with AC/DC and yet a tornado never touched down on his blonde brow. His limp pale body would be pulled from the shores in the dead cold of winter; notations cited as a drunken careening into the water’s half-frozen edge, symptomatically blamed on the vice of alcohol…and yet a tornado never touched down here. It did not touch down in the trailer parks, it did not touchdown on the school cafeteria. However, there was a hidden malice, which swept a multitude of young men; post-pubescent into the descent of lesser heavens and it was serial. The FBI were called in to investigate and all manner of trauma was insisted upon youth’s carelessness. These boys, these young men carefully swept under the gallivanting eyes of an inept police force. Whispers, the size of small tornadoes began to form on the lips of the towns people. Their fearful mutterings themselves small whirlwinds of American Gothicism. The tornado that did touch down was the distinction of death rent from that of life with a happy smiley face. As conjecture emulated a need for an answer, these small tornadoes…a sort of malevolent gossip began its meandering through collective psyche, much like the meandering braids of the Mississippi itself and yet no confirmed tornado crossed our path. It imbibed in me a yearning to put away those childish things as clichéd as the term childish things is and leave to a place where the threat of tornado would never give prey to the advance of my years. Calm Indian summers passed…bodies slowly keeping themselves closer to that of land to that of the river’s shores…particles of excrement of former victims held at its banks, undiluted by forming in the lungs of another young man, whose boyhood would vanish, encapsulated by tragedy and the brown water that would fill his lungs. You see Antony Skifton, he was not a swimmer. He did not even like that muddy brown vein of water with an impossible name that every child in the area learns to spell at such a young age M-I-S-S-I-S-S-I-P-P-I (said aloud, like a drill instruction). 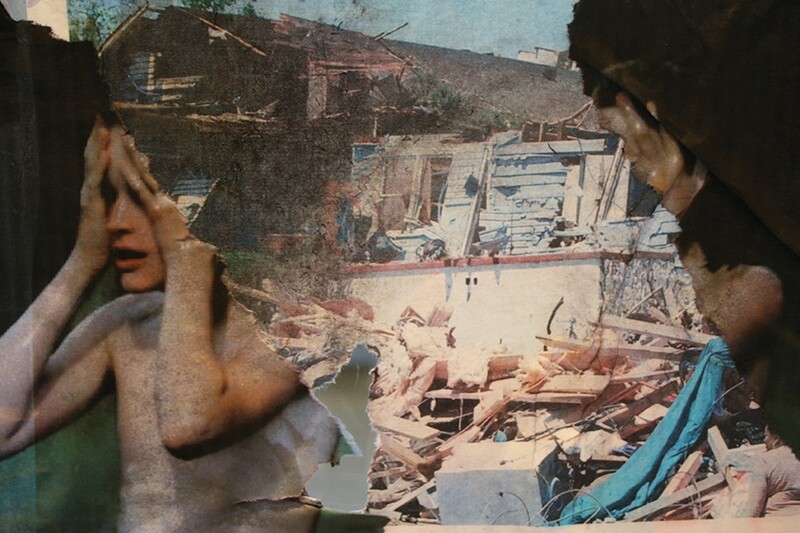 Here in La Crosse, a tornado did touch down, but its funnel, its whipping arms were filled with the debris of ancient folklore older than the whiteface living here and it became tantamount to a soft passage of abuse and cold blue skin. It imbibed in me a yearning to put away those childish things as clichéd as the term childish things is and leave to a place where the threat of tornado would never give prey to the advance of my years. 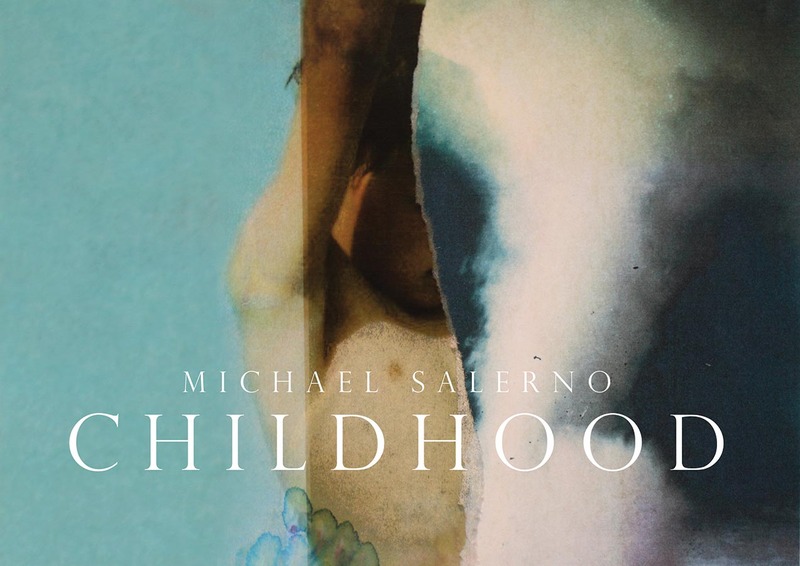 Michael Salerno’s book “Childhood” on Infinity Land Press is a slow behemoth of articulated components of what it means to be a young boy grown older. There are a series of natural disasters from Ohio and other parts of America juxtaposed in the form of tornadoes and the carnage they produce against a catalogue of pre-pubescent boys. These boys are not sexualized, but they are horrified… that is to say made horrific. This is a result of degradation to the image, which Salerno has appropriated. To say they are “Wet Boys” like the corpse of my high school friend Tony Skifton, seems apt. Wet in the sense that the visceral cocoons; the plasma that surrounds their image through process of deterioration is complimentary to that of the tornado or cyclone found on opposing pages. 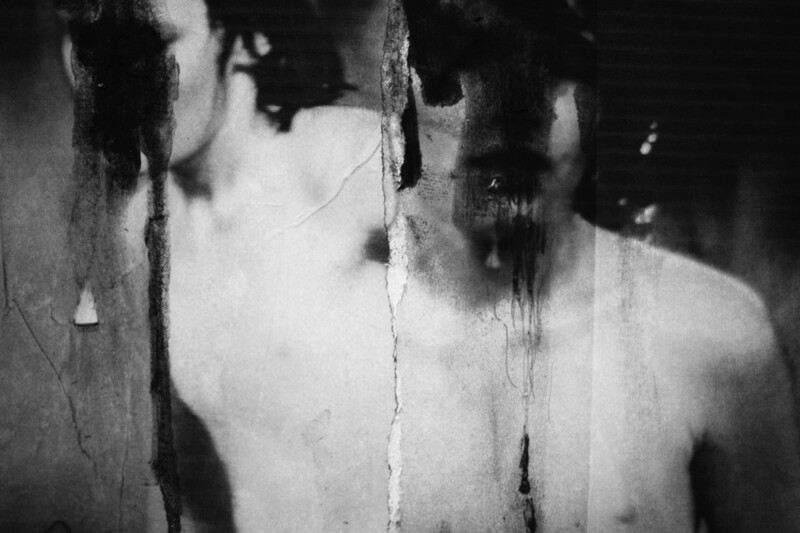 Martin Bladh’s exceptional essay on the psychoanalytic potential of these images covers many of the bases I would normally like to speak about, talking of the transposition of fear, desire, and the cacophony of growing up male. It is an often over looked experience in society. By and large, we associate a very simple pathos to the insecurity of boys and men. This pathos hardens within a young boy into adulthood. It is perhaps a clandestine response trigger to the social norms of what we are supposed to be…insensitive, strong, without emotion, but few of us feel that way or if we do, we become stilted versions of the children we were. We grow unable to access an outlet through which to associate. Salerno’s book has many layers, not only in metaphor, but also in the actual images themselves. Some of this potential for metaphor seems to lie on the surface or to become absorbed in sexual identity politics and gender issues. Think of River Phoenix, McCauley Culkin, and Wonderland… then forget it. I highly recommend this book for the intensity it purports to administer at first glance. I further recommend it for the subtleties it actually exudes when time has been taken with it. 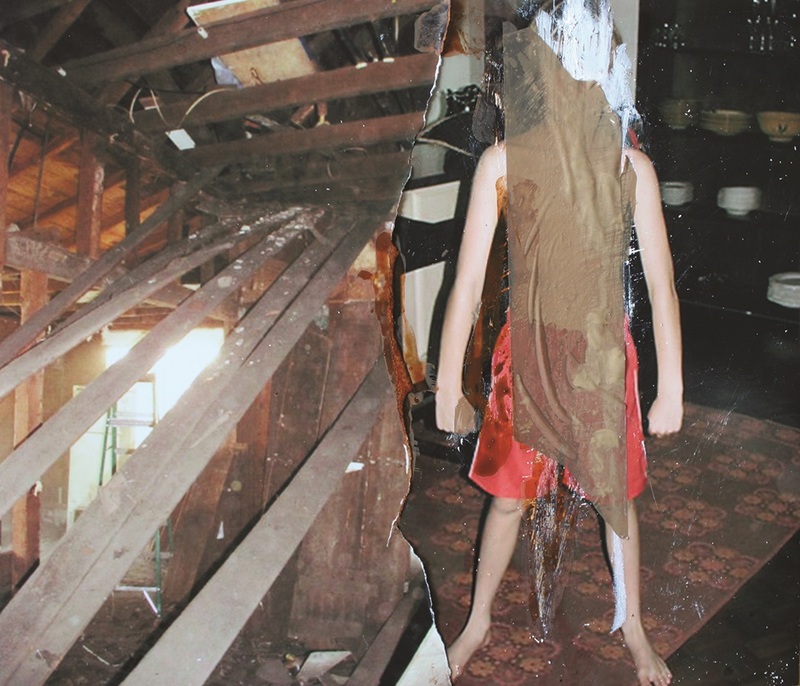 Posted in Reviews and tagged American Gothic, Anthony Skifton, Archive Highlights, Book Review, Brad Feuerhelm, Infinity Land Press, Kiddie Punk, La Crosse Wisconsin, Martin Bladh, Michael Salerno, Photographic Collage, Serial Killer, Smiley Face Murders.